MA2 awaiting its next steaming at the Don River Railway during May 2003. Some of the MA-class modifications can be seen: the extra sandbox above the leading driving wheel and the redundant forward sander at the boiler dome. This locomotive was built by Robert Stephenson & Hawthorns Ltd in 1951 as their builder's number 7421 and originally numbered M1 of the Tasmanian Government Railways' M-class 4-6-2 locomotives. These locomotives were built to the proven design of Indian Railways metre-gauge YB class pacifics. In 1957 the Tasmanian Government Railways began a program to modify a number of the M-class to make them better suited to freight work. The modified engines were known as the MA-class and were modified by fitting smaller diameter ex-Australian Standard Garratt (ASG) driving wheels and ex-B & C-class pony wheels. The weight distribution was also altered to place more weight on the driving wheels. New sandboxes for forward running were added on the footplate beside the smokebox, while the original sandbox in the dome was retained for reverse running. Locomotive MA1 was the trial conversion in 1957, while MA2 - 4 were the production conversions completed between 1957 and 1958. 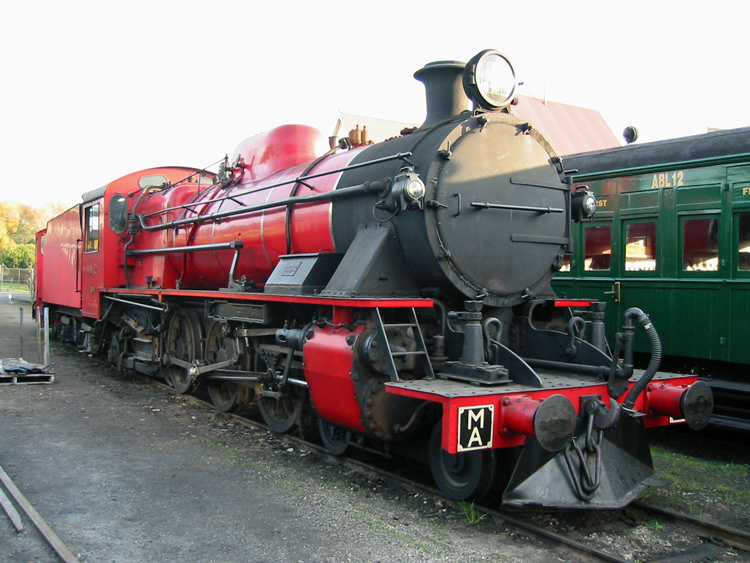 MA2 is preserved as an operating exhibit at the Don River Railway, from where it has occasionally worked onto the Tasmanian main lines for tour train duties. As at 2013 I understand it is stored unserviceable in the Don workshop, pending some repairs. a Cooper, G & Goss, G 'Tasmanian Railways 1871 - 1996, 125 Years - A Pictorial History' published by C G publishing Company.